Islamic Republic's deputy police chief for social affairs, Commander Montazerolmehdi, said in a press conference on Tuesday, that Iran's police will be going after those Iranian actresses who do not observe the Islamic dress code abroad, via the help of the Interpol. 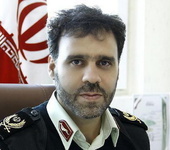 Commander Montazerolmehdi's real name is in fact Saeed Artimani, which he later changed to Montazerolmehdi. He was a simple Baseej member during his youth and lived around Ghassr Firoozeh district. His main hobby then, was to stop school children younger than himself and search their bags for illegal CD and DVD tapes, which he confiscated and kept for himself. Those who remember him from his Baseej days, wonder how he was ever promoted to such a position in the police force. Clearly however, whatever police academy he attended, didn't teach him that the Interpol and the Guidance Patrol, were two entirely different entities. Well being a monkey moron who lines his own pockets is the biggest qualification you need in this black shirted Regime. That's why after Chimp Ahmadinejad, the next rigged president will either have gorilla or baboon traits. In otherwords the biggest ape puppet Khamenei can manipulate!